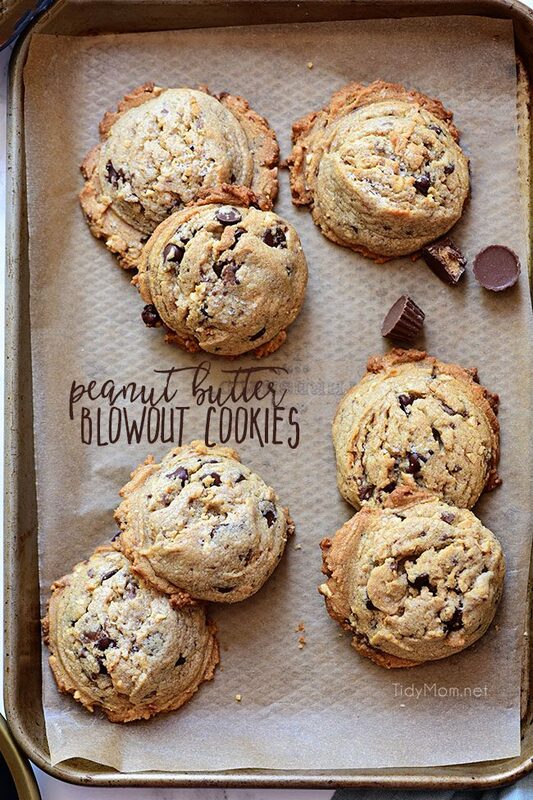 Peanut Butter Blowout Cookies. This is not your ordinary peanut butter cookie. This peanut butter cup cookie is packed full of peanut butter, chocolate chips, Reese’s Peanut Butter Cup Minis and honey roasted peanuts. The ultimate peanut butter lover’s cookie recipe. Guys these Peanut Butter cookies are no joke… There’s a new and different taste in every bite and so much flavor your taste buds won’t know what to do with themselves. Anyone who’s ever looked in our pantry knows there is always at least one package of Reeses Peanut Butter Cups, and the biggest jar of peanut butter you can buy. To say we are a peanut butter loving family would be an understatement. The key to my husband’s heart is a fresh batch of peanut butter cookies, like my peanut butter gooey butter cookies. So I knew these peanut butter blowout cookies would be a huge hit. Man was I right, I’ve never seen cookies disappear from a pan so fast in my life. It was like I was living with a group of little peanut butter gremlins. These cookies are even great for taking to parties or gatherings, as long as you check for allergies first. My daughters are obsessed with the bachelor franchise (I don’t get it, but to each their own I guess) and they have a girls night watch party every Monday with some friends. Watch parties are never complete without a good snack making it the perfect place for Peanut Butter Blowout Cookies. Nothing pairs better with drama and gossip than a good cookie and all of their friends agreed. Bachelor night and these cookies were a match made in heaven, unlike most of the couples that come out of the show ;). They are called blowout cookies because they are exploding with peanut butter and chocolate and will blow your mind and taste buds. You will need Reese’s Peanut Butter Cups (I used the Reese’s Peanut Butter Cup Minis because they were quicker to chop up and they do not need to be unwrapped), honey roasted peanuts and creamy peanut butter. 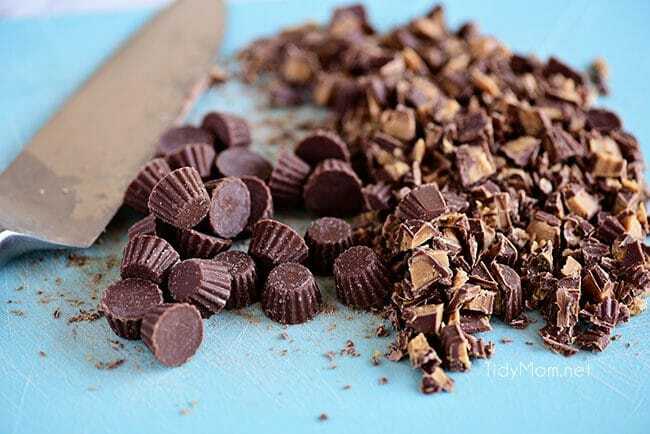 TIP: Freeze the peanut butter cups before chopping to make them easier to handle and place chopped peanut butter cups back in the freezer until ready to add to dough. I’m not sure how you feel about nuts in your cookies. 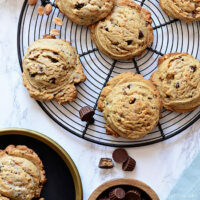 Generally, I prefer to leave them out, but I really thought these peanut butter blowout cookies called out for honey roasted peanuts and I’m so glad I added them. They not only gave the cookies that extra peanutty punch but add a little crunch to this big soft cookie! 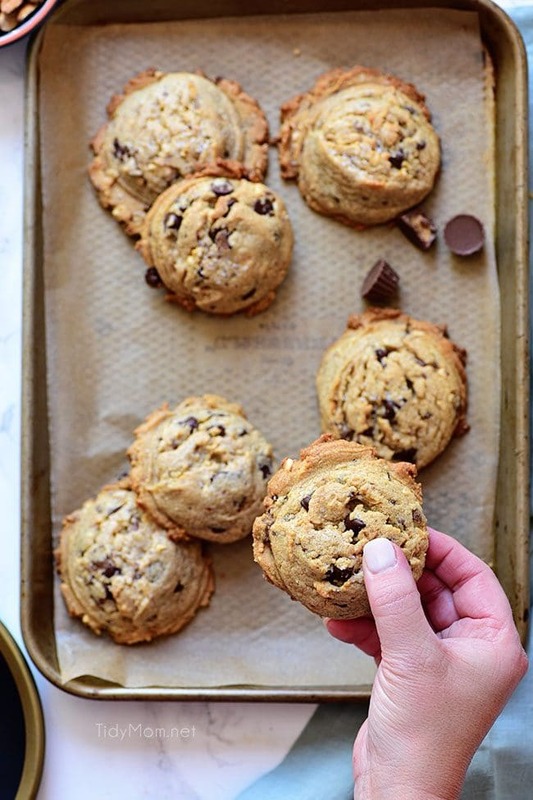 Since these cookies are loaded with chunky goodness, I wanted to make them big and thick. You will want to start with room temperature eggs and butter to decrease spreading. Over mixing the butter and sugars is another way to get deflated cookies that spread all over the pan. Cream room temperature butter and sugars about 1-2 minutes with an electric mixer on medium should do the trick. I did refrigerate this dough for about an hour, just to help the dough hold together a little better. 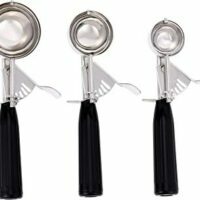 A small or large cookie scoop is best to get a nice heap of cookie dough, similar to a scoop of ice cream. These cookies don’t spread much, so the bigger your mound of cookie dough, the better. I made two sheet pans with my large cookie scoop (3 tablespoons) and the rest of the dough I used a small cookie scoop (1.5 tablespoons). 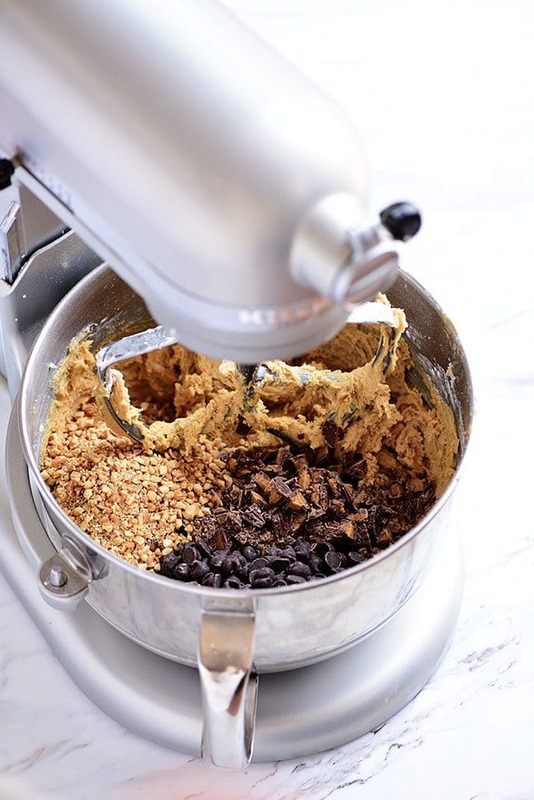 After scooping out the cookie dough I sprinkled each cookie with just a little kosher salt, it really brings out all the flavors – if you’d never tried it, promise me you’ll at least give it a try, even if it’s just on a few cookies. The larger cookies, of course, will take a little longer to bake, so don’t mix sizes on the pan. The large cookies took about 16 minutes in my oven, and the smaller cookies baked in 11 minutes. 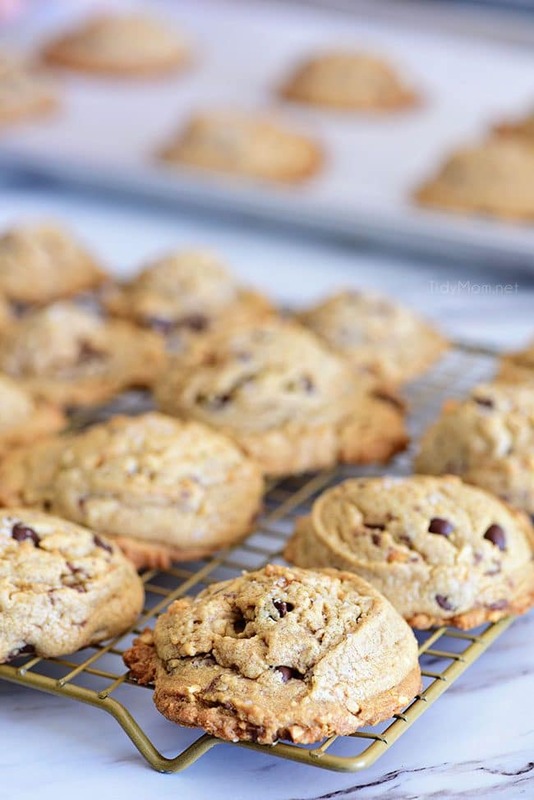 Your cookies could take longer or shorter depending on your oven. Once the cookies look lightly browned on the edges and the centers are just starting to set, they’re all done and ready to enjoy with a glass of milk. Once these cookies these come out of the oven, it might be hard to make yourself wait until they cool to dive in. Unless you’re a fan of burning your mouth for the sake of a good cookie, I recommend refraining. As soon as these goodies get to that perfect still slightly warm temperature I say go for it! There are few things in life that are better than a cookie still warm out of the oven. Now, I don’t know about you but looking at all these pictures for the past hour I’m craving cookies. If you need me after this you can find me whipping up another batch of blowout cookies because they’re just too good. 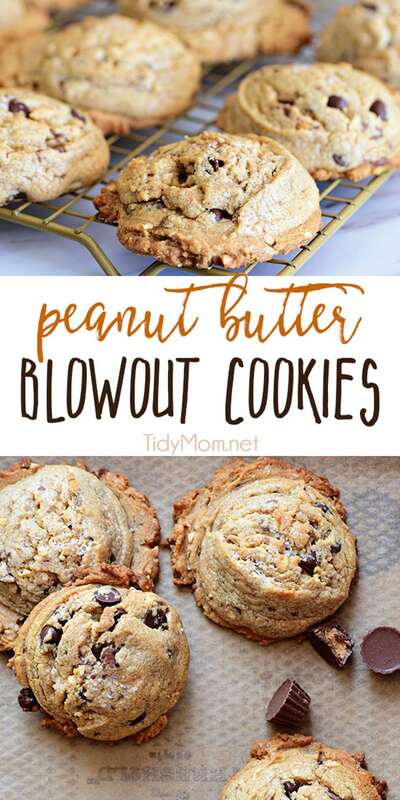 LIKE THIS PEANUT BUTTER BLOWOUT COOKIE RECIPE? PIN IT! 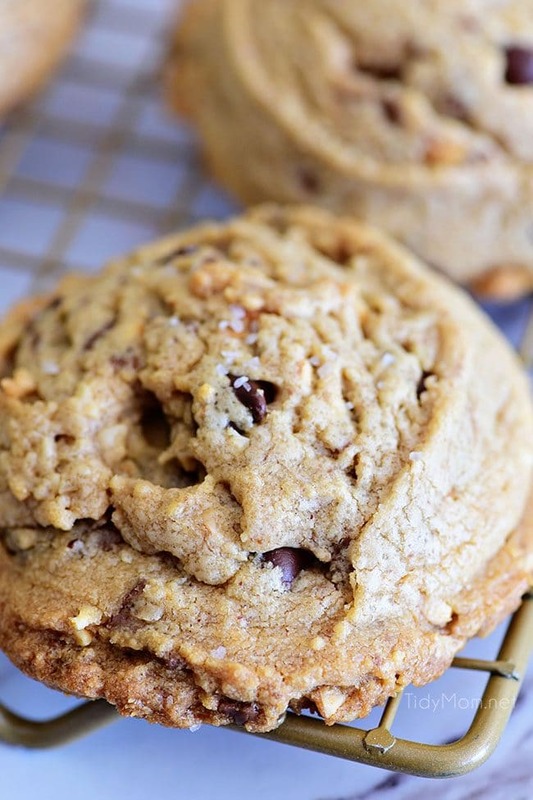 This is not your ordinary peanut butter cookie. 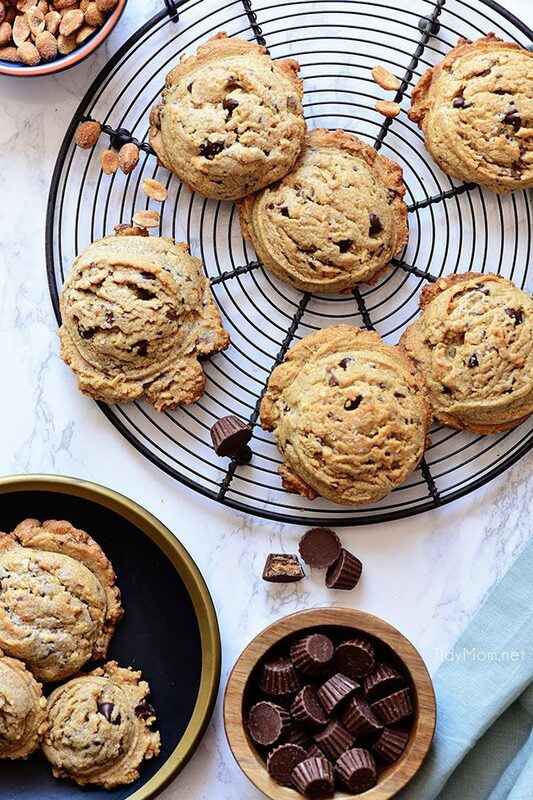 This peanut butter cup cookie is packed full of peanut butter, chocolate chips, Reese's Peanut Butter Cup Minis and honey roasted peanuts. The ultimate peanut butter lover's cookie recipe. Whisk the flour, baking powder, baking soda, and salt together in a medium bowl and set aside. 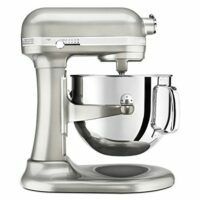 Using an electric mixer, cream the butter and both sugars on medium speed until smooth. Add the eggs and vanilla and beat on high until well incorporated, stopping to scrape down the sides and bottom of the bowl as needed. Add the peanut butter and, continue mixing on high until well combined. Carefully add flour mixture to wet ingredients; mix on low just until combined and soft dough is formed. Add in chopped peanut butter cup, chopped peanuts, and chocolate chips; mix on low until combined. Chill the dough for about 1 hour in the refrigerator. 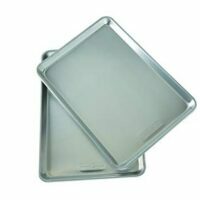 Preheat oven to 350° and line cookie sheets with parchment paper or a silicone baking mats. 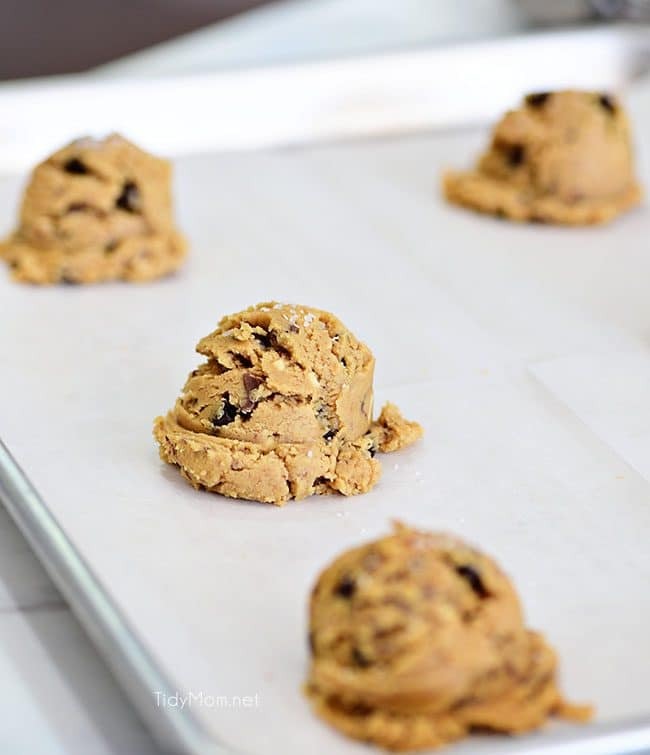 Scoop chilled dough into heaping tablespoon balls, or use a large (3 tablespoon) cookie scoop for larger cookies and place on prepared cookie sheets. Sprinkle each cookie with a pinch of kosher salt. Bake each batch until lightly browned on the sides. 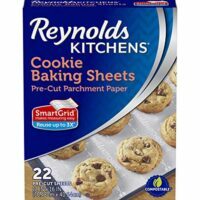 The centers will look soft; 10-12 minutes for small cookies or 15-18 minutes for large cookies. 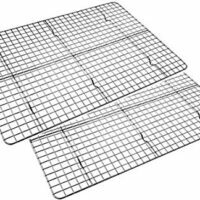 Remove cookies from oven and let cool on the cookie sheets for 5 minutes, then transfer to a wire rack to cool completely. Store in airtight container at room temperature for up to 1 week. 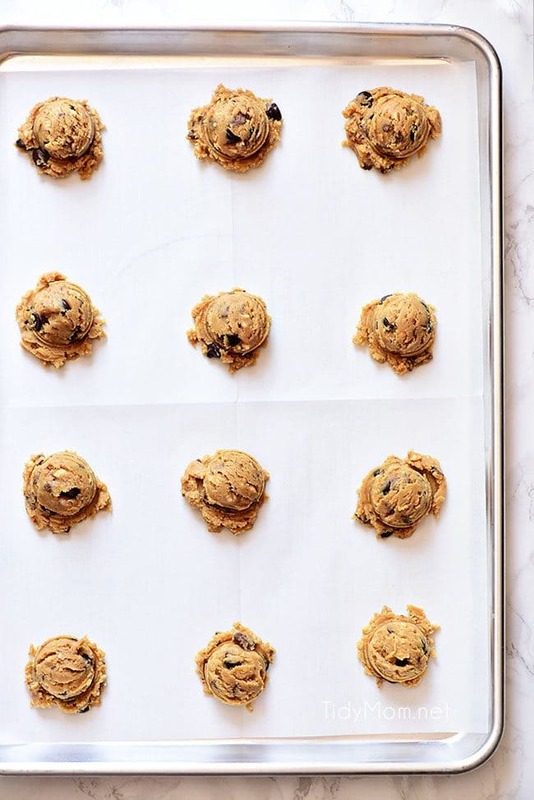 Cookie dough can be chilled in the refrigerator for up to 2-3 days. Bring to almost room temperature (I find slightly chilled dough easier to work with) before scooping. Baked cookies or unbaked cookie dough balls can be stored in the freezer for up to 3 months. Bake frozen cookie dough balls for an extra minute, no need to thaw. Click here to get more of my cookie baking tips.